Amchoor or amchur is dry mango powder, a very intrinsic component of north Indian cooking. Amchoor is a popular souring agent in north Indian cooking. Any simple curry or stir fry can get an added zing with a finishing dash of amchoor powder. It is also used for chutneys and some pickles too, like the famous bhari mirch ka achar, red Anaheim peppers stuffed with a hot and tangy spice mix and pickled with mustard oil. My grandmother used to bring dried raw mangoes from the village which was actually dried when the raw mangoes were in surplus, we had mango orchards back home. Raw mangoes were peeled and cut into 4 parts with the stone, just discarding the inner seed, then it was dried and preserved for the whole year. The raw mangoes sun dried this way are called 'aam ki kaliyan' as it has a bud like appearance after drying. It is still available in some wholesale markets and some people buy it to get pure amchoor at home. Mangoes dried in this way was pounded in mortar and pestle to get amchoor powder, it was really labor intensive and the powder was a bit darker in color due to slow drying of the thick cut mango pieces, and the amchoor was not very fine. Thankfully I found a better way to make my own amchoor powder. I make amchoor powder at home simply because the store bought one is not good enough. You will see the difference once you make it at home. I make a wet preserve of raw mangoes too for different recipes, especially chutneys and pickles, and will post later about that. Making this powder is not at all labor intensive if you make a small quantity. 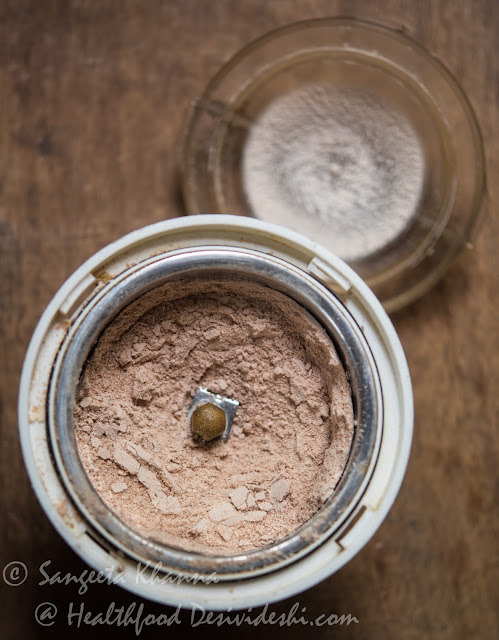 A tiny quantity of this homemade powder lasts long as it is quite intense. I usually make powder of about a kilo of raw mangoes which yields about a cup of amchoor powder and this, to your surprise, is equivalent to 4 packs (100 gm) of amchoor powder. This quantity lasts the whole year in my kitchen and if you need more than this you can conveniently make it twice. It will be easier to handle and grind in smaller quantities. This time I took just 500 gm of raw mangoes as my previous year amchoor had finished and I needed some for the chhole I was so craving. Yes making this amchoor is that easy especially in this Indian summer heat when the sun drying was done within a day due to very hot sun. Fast drying the raw mangoes gets you lighter colored amchoor and is convenient as you have to sundry it just for a day. Or may be 2 days of north Indian summer sun. See how do I do it. 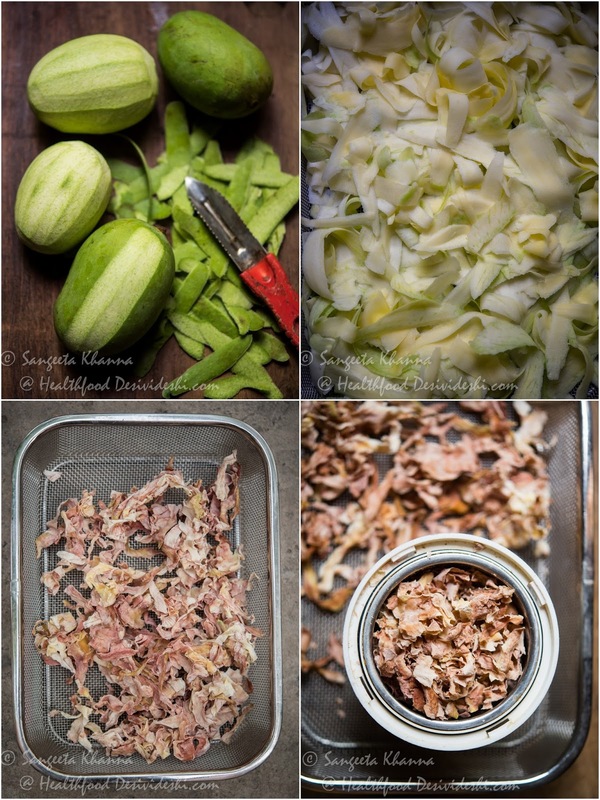 Using a potato peeler peel the green skin of mangoes and discard the peels. 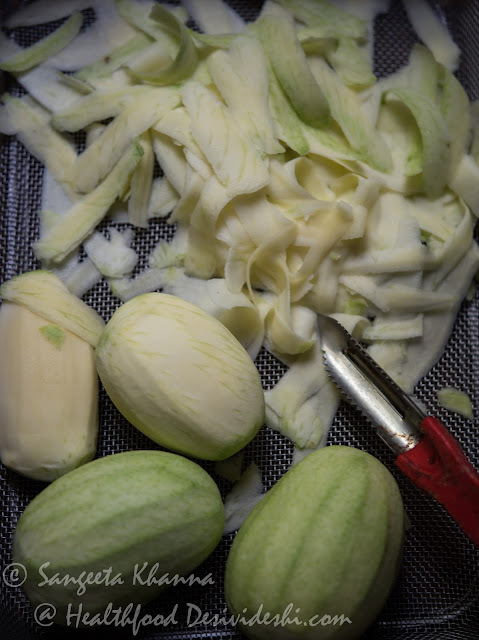 Now using the same potato peeler, work on the white flesh and peel strips of mango flesh. I used 4 large mangoes and it took about 15 minutes. Discard the stone. 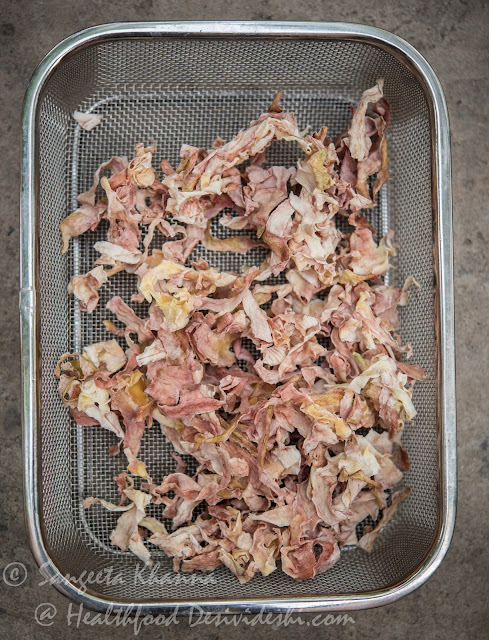 Keep the strips in a sieve or a shallow basket and sun dry till the strips get completely dry, you may want to turn the strips in between for faster drying and to prevent the thin strips from sticking together. It will look like chips and will sound crisp after drying. Crush the sun dried strips of raw mango by hands and stuff it all into the grinder of your mixie and whiz n zap. Fresh amchoor powder is ready. Use this home made amchoor powder carefully. You need only 1/4 the amount as compared to the store bought one. Isn't it easy and quick? It takes only 15 minutes to peel and a minute to grind in the mixie. And if you cannot sundry the strips like me I'll tell you another way to dry it. Only if you ask me. And now the chhole I had been so craving for that I made the amchoor on a whim. Yes, normally I make the amchoor when the raw mangoes are a bit cheaper but this time it was bought for Rs.100 a kilo. Not regretting the expensive mangoes at all. This is the quickest version of chhole I make and it is such a simplistic recipe that you can have chhole kulche even for a breakfast, or for your lunch box. It uses minimal spices and even lesser processing. Sprinkle amchoor and coriander leaves or mint powder (or both) and mix well so that the chana daal is mushed up and the chickpeas get coated with a thick slurry. Deliciousness. Serve hot as you like it. You really have loads of patience dear. Why does the mango in the pic appear so blackish in colour? Is it a brightness problem or my eyes need a check, anyways.. I liked ur regular masala, should try it in one of my curries some day...I am quite lazy these days...errgh..the chana is inviting me to finish it off. I am a little sensitive to mustard oil though S loves it and I never miss out ajwain in the chana for all the airy effect it produces. LOL. Keep up the good work dear, I am happy u are not lazy! Thanks Pari and don't strain your eyes over the blackish mangoes , he he....i wanted to play with the light effects and sometimes i like these shady rustic pictures....n they are always straight out of the camera...never mind. as for ajwain i don't add ajwain to chhole n i think no punjabi would like that.....and when the chhole is so low fat n no frying of onion etc. it will never cause flatulence.........i've never experienced it at least. 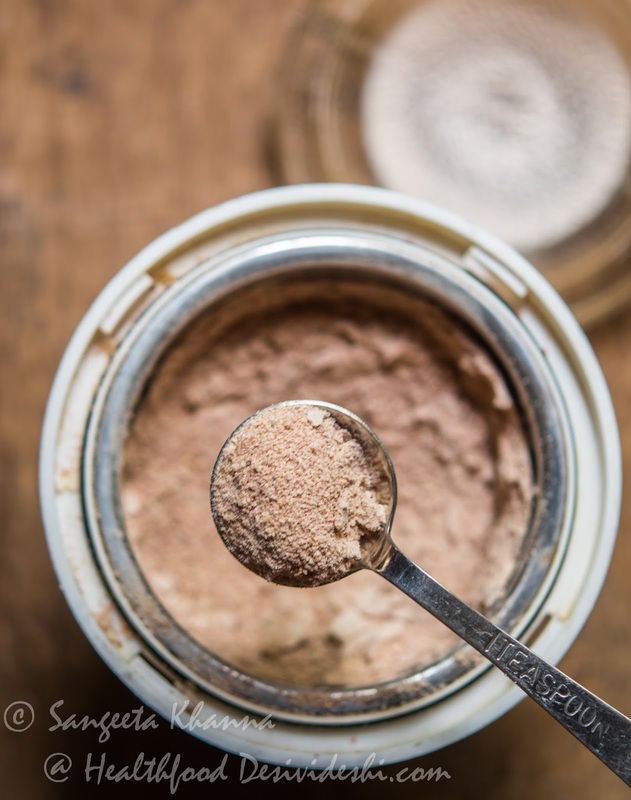 I have never made amchoor powder at home but I am sure it tastes way way better than the store-bought variety! getting good raw mango here has always been a struggle.. I so much miss making all the green mango recipes. So what's the secret behind this another way.. cool Sangeeta,meticulous in peeling,drying..
Sangeeta, great method of explaining and the clicks look so tempting. Thanks for sharing. Hey sangeeta, nothing can beat home made amchoor...my grandma use to make it and store it as whole not in powdered form...it tastes gr8 in dals,chutney,sabzi anything. @CF yes chana daal gives a nice texture and the taste of this chhole is more like the street vendors.....they always make quick tasty things no !! nice post and effective , u never know , what they sell in the market in the name of Amchur..
yes only small quantity like this can be dried in the fridge but you got the point about the store bought amchoor.........it is always adulterated , sometimes as harmless as starch is added but it is not as strong an amchoor . This looks easy. Amchor as an ingredient is something I was introduced to just a few years ago. In the South, we use tamarind, kokum, sol as souring agents. 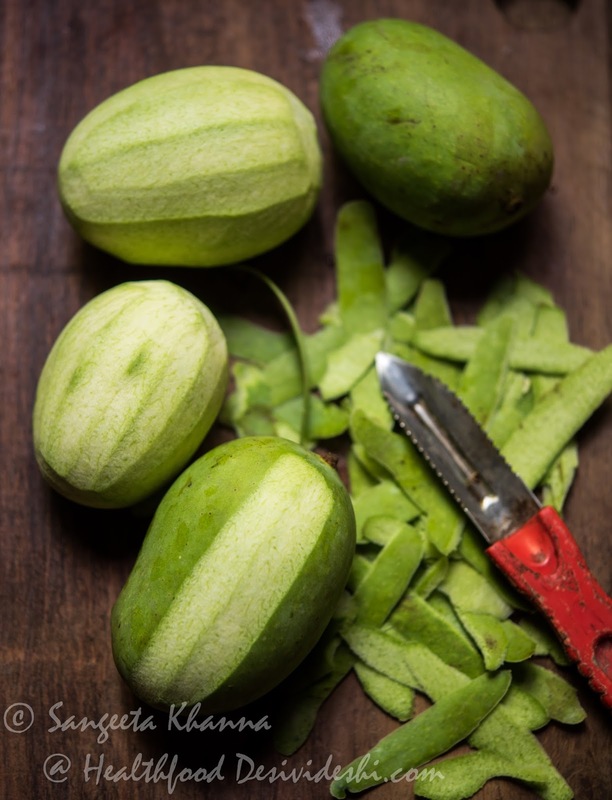 Green mangoes are used in dishes, but not amchoor. This looks so simple though, that I will have to try it. Have 4 green mangoes in the fridge right now which I was planning to make a prawn curry with, but this seems more tempting. Will let you know how it goes. Thanks Kim......i'll be eager to know how did you like the process n the amchoor. the heat now a days is just fine to do this....if there is no ole...he he..
brilliant! i love amchoor, but never thought it could be done at home. love this! I did not know you had two more blogs. Amazing.... I just went through a couple of recipes and posts on herbs and aloe vera on the both the blogs. Its great. I did not know how amchur powder is made at home. I always buy the ready made ones. thanks for posting this recipe. may be next year, when raw mangoes come the season, I may try making amchur powder at home. I am so making this. This is super easy. Its sunny here today. Last two days were raining. So I will ask about the 'secret method' if its raining tomorrow. Going to try it here in North Queensland as well. Trees full of mangoes, have frozen and dried flesh, made chutney, mango salsa, and also love Amchoor and cannot buy it in the rural area where I live. Besides, I also prefer to make my own food so this is great. Thank you. Maybe microwaving the green mangoes will help dry them sooner.